Buying the playground equipment for kids is not an easy job, whether you are looking for your backyard or community park sets. To make it simpler for you, we are here with the list of factors to be considered while selecting the play sets. These factors would help you out in taking the right purchasing decision. The first thing that you should consider is the quality. Ensure that you are dealing with International Playground Equipment Manufacturers Association (IPEMA) certified manufacturer. It clearly defines that the manufacturer is involved in distributing premium grade playground equipment to the customers. 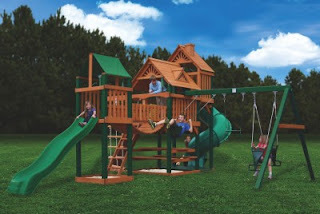 Consider that the manufacturer has designed the playsets as per the guidelines defined by American Society for Testing and Materials (ASTM) and Consumer Product Safety Commission (CPSC). Next thing that comes is the material used in constructing the playground sets. These are available in wood, steel and metal to the customers. Whether you are buying a see saw, slide, swing set, dome climber or play house, make sure it is constructed with superior quality material. It should be strong, durable and can give non-stop hours of fun to kids for years on end. Do not negate the security factor while selecting the play equipment. Consider that the manufacturer has installed the essential hinges, railings, bars and other essential anchors at the requisite places in the playground sets. Another thing that you can look for is the size of the play set. Measure the area where you want to locate the equipment. By this you would get an idea what size of sets you can select for the playground.